The "Rags to Riches" statue sits behind Cinderella Castle in the Magic Kingdom. 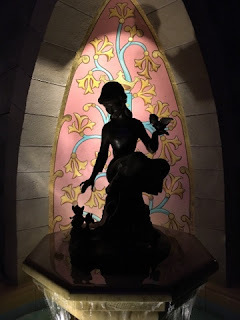 It depicts Cinderella as a servant, but shows a crown painted on the wall behind her. If a child is standing in the right spot in front of her, it looks like the crown is sitting on the head of this princess. I like the way she appears as a sillouette in this nighttime shot.